At least, that’s how I heard it at first. And thought–Gee, I hope so. Her own patch had faded, and, a talented cook, she wanted some of mine to use in baking focaccia bread. 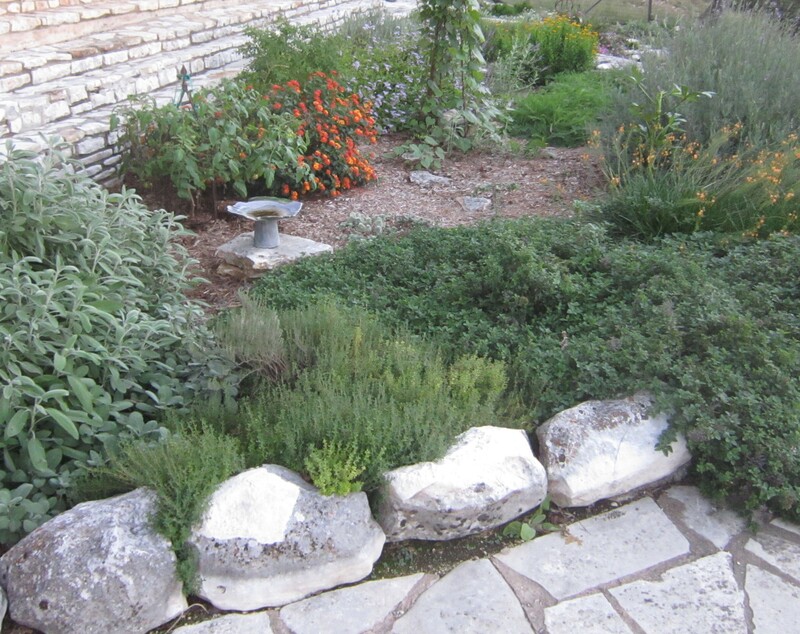 In the photo of my herb garden above, the thyme is at six o’clock, with sage at seven and oregano at five. 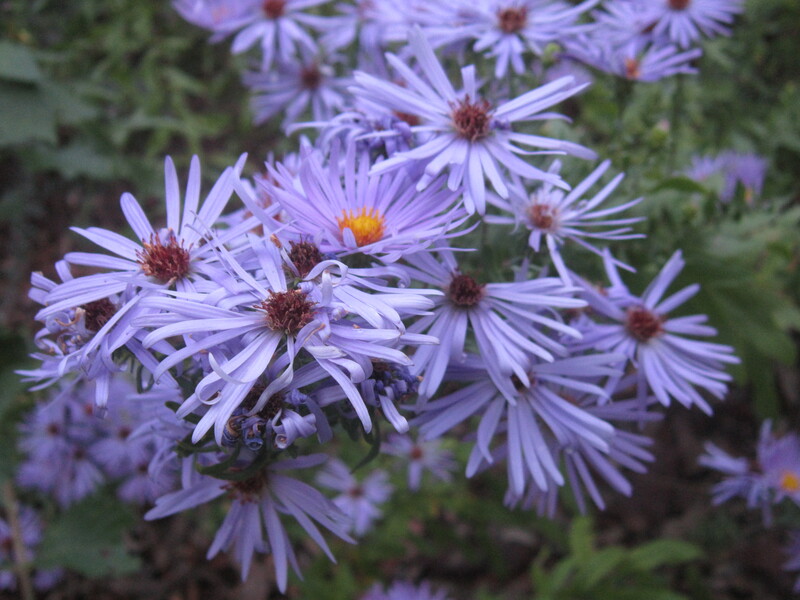 At this time of year, it’s easy (in my mind, at least) to connect the winding down of the growing season with our own mortality. This is the week of Halloween and Dia de los Muertos, after all. The photo at top shows the current angle of sunlight in the late afternoon amid shadows of trees along White Oak Creek. 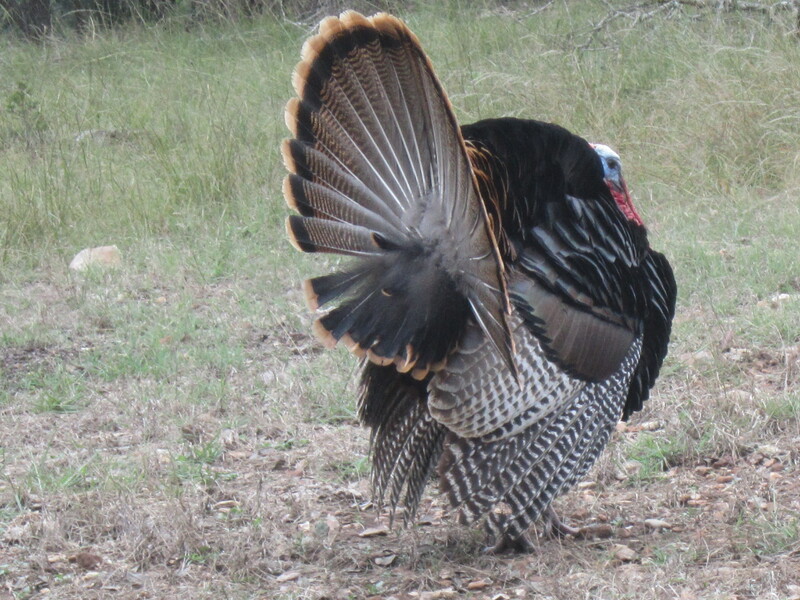 As the sun here in the Texas hill country starts to slant from the south, tracking its cyclical arc across the sky, other natural systems show similar changes as well. 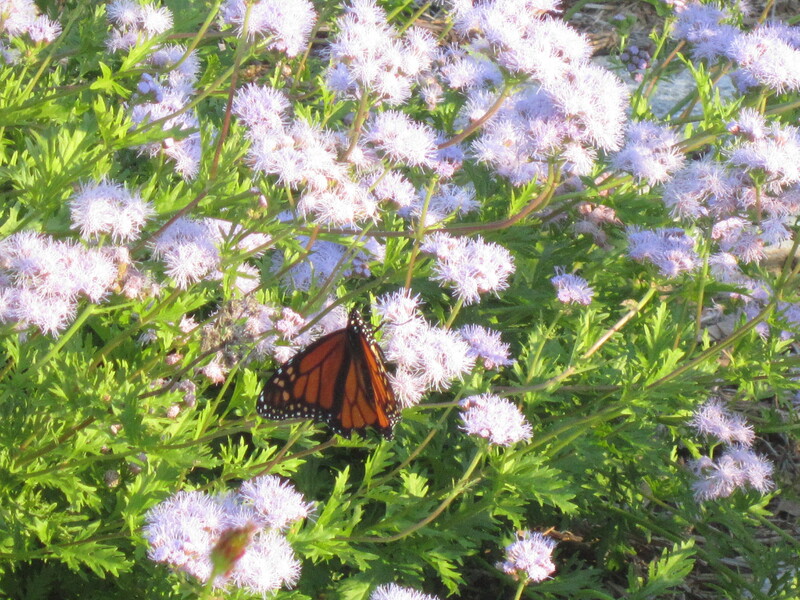 The migration of monarchs over the past two weeks drew my eye, as groups stopped to nectar on the gregg’s mistflower and tropical milkweed in my yard along with frostweed and native milkweeds in the pastures. On one of my walks along the creek, I found open pecan hulls and shells picked clean by squirrels lying on the ground. That must mean it’s time for the World Series. I will always associate gathering pecans with watching baseball playoffs with my dad in late October. A few trees have some tinges of color, but most leaves haven’t turned yet, and only the native walnut trees have really begun to lose theirs. Here it will be close to Thanksgiving when the Spanish oaks flame red and the escarpment cherry trees turn gold. 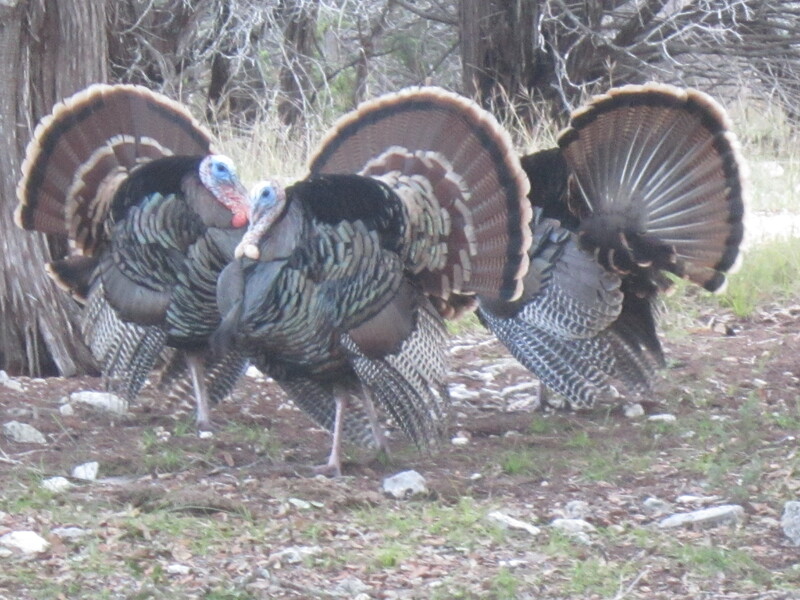 Turkey gobblers are performing their distinctive displays. My young pomegranate tree is beginning to set fruit. It’s cool enough that I don’t change out of my jeans into shorts immediately after riding horseback. And perhaps best of all, we had a blessed autumn rainfall week before last, more than six inches, not enough nor widespread enough to end our long-standing drought but enough to help my spirits. After the rain, the purple coneflowers in my back yard showed new growth from among the trimmed remains of heat-damaged leaves. I find myself hoping that it doesn’t freeze soon. By that, I really mean that I hope we have some growing time left. What memories do you associate with late October? What natural cycles do you notice happening right now? Here’s a photo of the same kind of vine my friend Sarah mentions in her comment below. We saw it growing on a tree on her property as we rode horseback a few days ago. 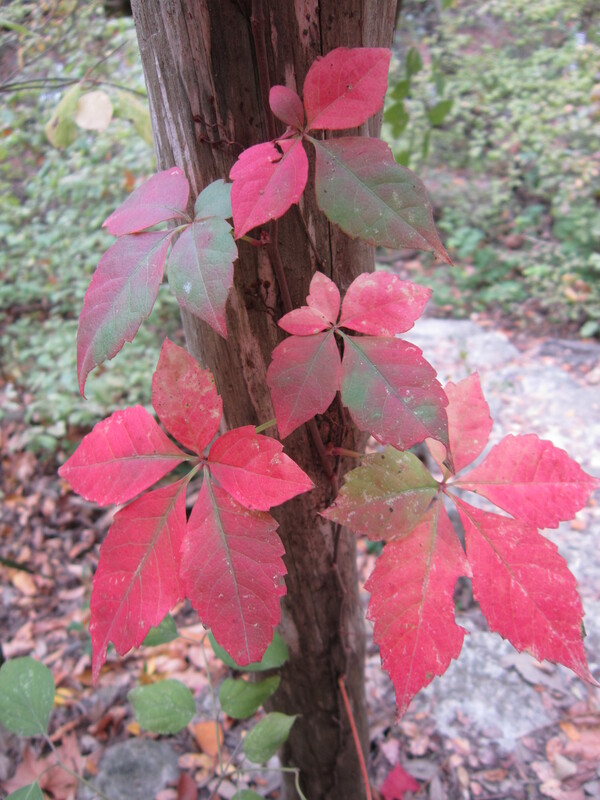 It’s called Virginia creeper, and I took this picture last fall at the Cibolo Nature Center at Boerne, Texas. This entry was posted in awareness, butterflies, flowers, hope, landscape, secret glories, Texas hill country, trees. Bookmark the permalink. 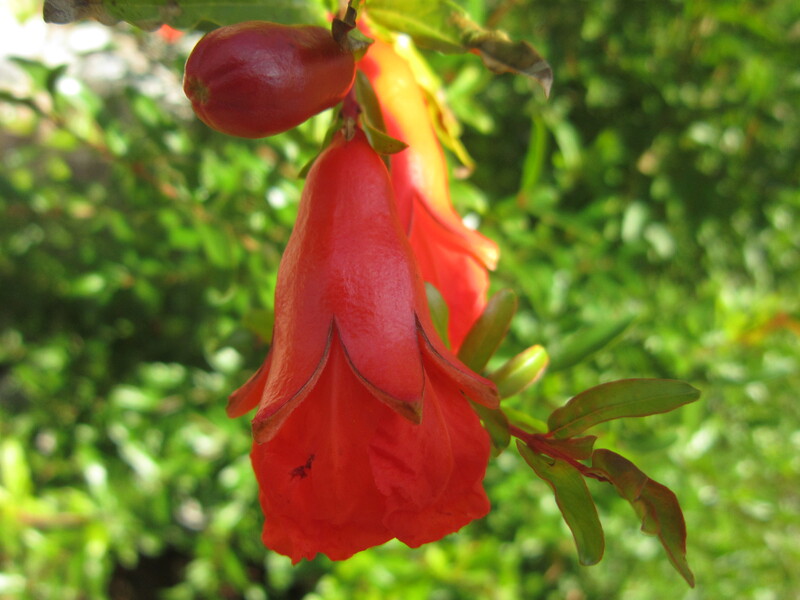 Is your pomegranate tree in the ground? How long did it take to establish? I think my yard needs one! Yes, it’s in the ground, Mo. I planted it two years ago, and it had a couple of little pomegranates on it when I planted it. 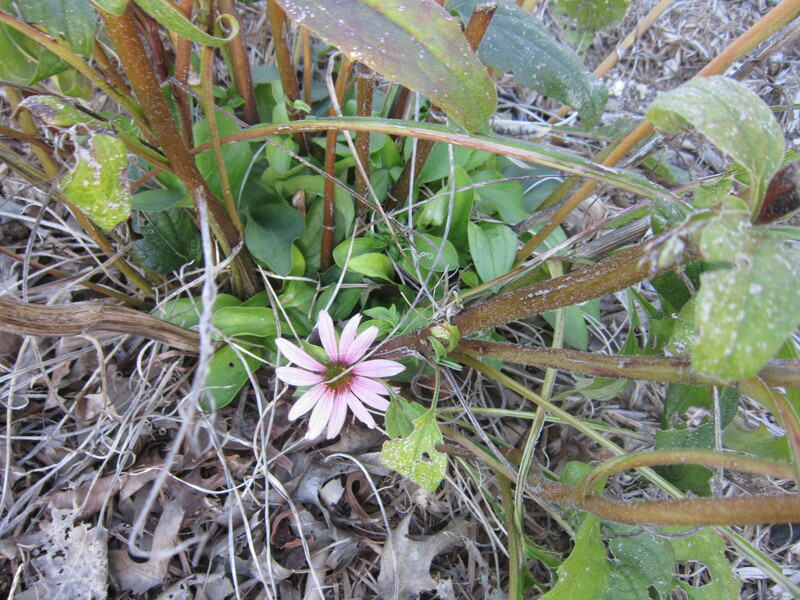 It’s still small, but it has bloomed profusely both years. So far, the pomegranates themselves have been small as well. I bought it at Alltex Nursery (http://www.alltexlandscapes.com/) and planted it where it has a little radiating warmth from a stone walkway nearby. Great post Chris! I’m glad I got to enjoy the monarchs as well while we were riding! This is my favorite time of year ’cause of the cool night & morning temps, leaf changes and frisky ponies! You will have to remind me of the name of the “creeping” red vine thing we saw last weekend! Thanks, Sarah. I posted a photo above of Virginia creeper, the type of vine we saw. It’s a good indication of autumn, for sure. Thank you for reading and for encouraging me and for being my horseback riding buddy. I like the pace of our trail rides–just right for noticing the beauty around us. This time of warm cool and gold blue is my favorite. Time stops for a moment of deep joy in life. It is a quiet crescendo to the cycle of growth. I, too, love this time of year. I can never decide if I love April or October more. And I so love your last thought–spring revisited with wisdom. Thank you, once again, Linda. Late October always brings to mind the Illinois autumn chill, crisp Jonathan apples wrapped in Mom’s from-scratch caramel, delightfully sticky hands and chin, carving pumpkins with my sister Mary Ann while Mom supervised but never interfered, creating always-home-made Halloween costumes, starting the trick-or-treating feeling chilly, ending the evening too toasty warm inside the costume. I recall the same traditions with my own children and this year experienced them with my two-year-old granddaughter. Mom is 95; Mary Ann becomes eligible for Medicare next month; in eighteen months, I join her.The cycles of life shout to me in the autumn memories made with people I love and the traditions passed on through us. The red oak turning in my back yard, the chilly morning air making its way through my bedroom window, the struggling basil in my herb garden fill me with a mix of gratitude and uneasiness at the cycles of life. Jan, As I read this first thing this morning, I felt goosebumps on my arms and tears in my eyes. How beautifully written and how intensely felt. Thank you so much for sharing this! Hugs to you.